Updated Thursday June 23, 2016 by Ross Weinstein. 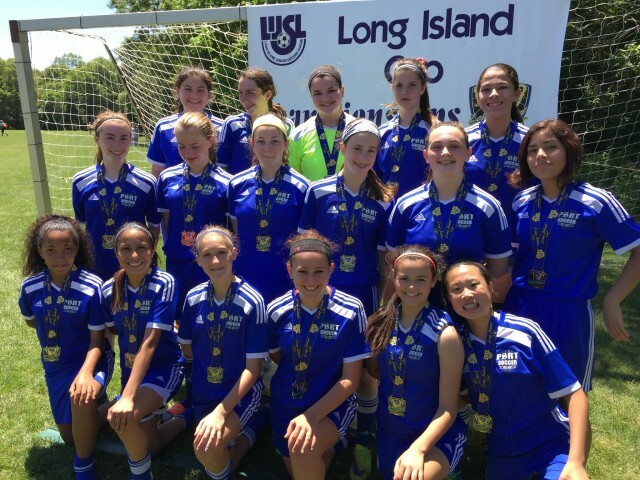 The PWSC would like to congratulate our two LI Cup Championship teams, the Girls U14 Sandstorm and the Girls U17 Panthers. Both teams took very different paths to their victories. The Panthers came back to win a thrilling 6-5 battle after going down 5-3 with 15 minutes left int he game. The Sandstorm cruised to a 5-0 victory while outscoring their opponents 16-0 over the course of the tournament. The PWSC would also like to congratulate the GU12 Blue Raiders for their 2-1 Runner-Up performance. In the late 1970's the league decided to conduct a Cup Tournament for all league teams. Through a single elimination format, every team in all age groups compete against each other across division alignments for the opportunity to earn the title of Long Island champion for their age group. In 1982, Chase Bank offered to sponsor the tournament, turning the LI Cup into the Chase Cup. Teams that reached the semi-finals were awarded t-shirts, finalists received trophies, and the winner hoisted the coveted Chase Cup Champions Trophy. After ten years of overseeing the growth of the tournament, Chase was unable to continue on as the sole sponsor of the event. However, another Long Island community stalwart, Waldbaum's, stepped up as a co-sponsor. In 1995, Chase had to drop its sponsorship of the tournament due to its merger with JP Morgan, and Waldbaum's took over sole sponsorship of the Waldbaum's Cup. In 2002, Vytra Health Plans also made a generous donation towards the tournament. Waldbaums continued on as the only sponsor of the Cup from 2003 to 2010, but Bankruptcy proceedings for the store's parent company, A & P, in 2011 forced the event's sponsor to step down. The tournament went on as the LI Cup for the first time since 1982. You now have the ability to pay by credit card and no longer accept pay by check as an online option. Signing up for this program commits your child to their selected team for the 2018/19 Fall and Spring Seasons. You now have the ability to pay by credit card, but we no longer accept pay by check as an online option. The cost of this program only includes regular season games. Intertown Soccer is a more relaxed alternative to Travel Soccer. Provide a fun, recreational experience. Give each player equal playing time in games. Develop soccer skills and strategies. We will also have a Saturday Team for Junior Boys starting on April 6th. This team will not travel out of Port Washington. They will practice on Saturdays from 1:30-3:00. Because they will not have regular games, the fee is reduced. If a parent volunteers to coach this team, they will be able to play some games in town on Saturdays.